Staples Canada has an awesome offer. 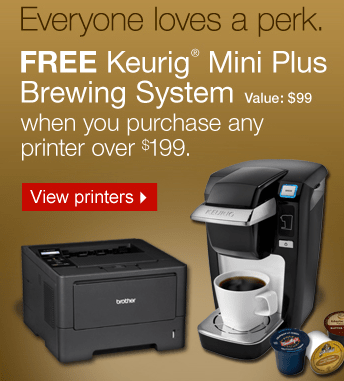 Get a free Keurig Mini Plus Brewing System (value: $99) when you purchase any printer over $199. When you choose your printer add the free item code #374648 and enter coupon code 74083 at checkout to get this special buy. This Staples special offer is valid until Tuesday, April 16, 2013.